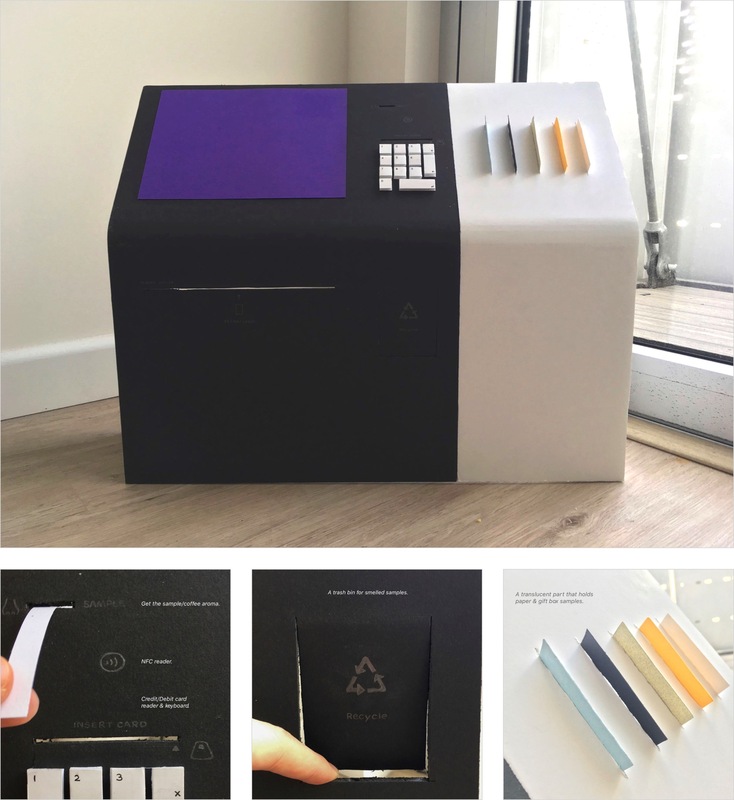 Letter Scent Kiosk is a project that practices design process comprehensively from research, prototype, test, iteration to branding and visualization. 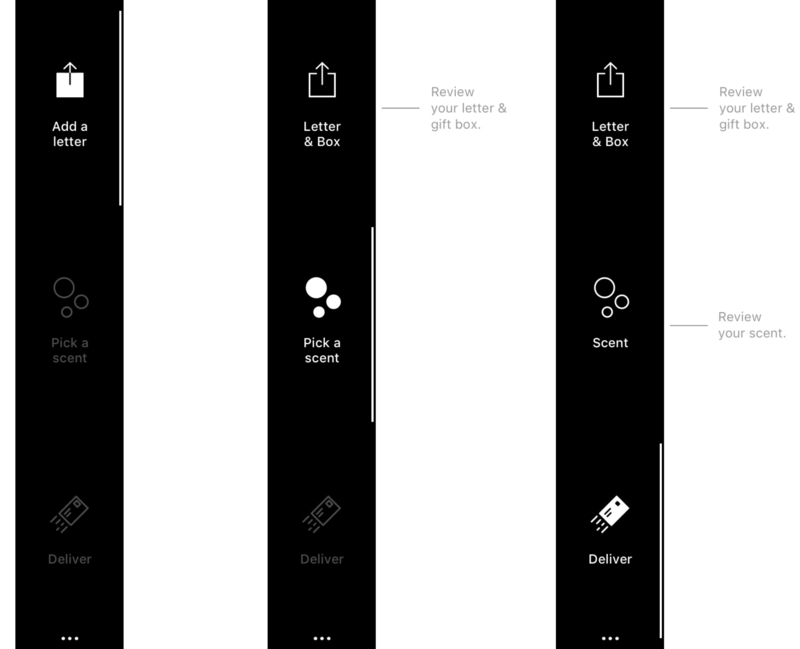 I was challenged to design an unexpectedly different gifting experiences on kiosk and apply the visual identity from an existing brand. What does sending a letter in 2017 mean? I talked to multiple letter-senders and listened to their stories, gifting experiences, and expectations. I learned that the emotion contained in the letter matters the most. How might we make the paper letters more personal and emotional? Provide a letter, discover a scent, deliver. I was inspired by the interviewees' experience with scent: as an addition to the letters, it is unique and emotional. What if we can add the right scents to the letters we send? I researched the categorization of the fragrance library. 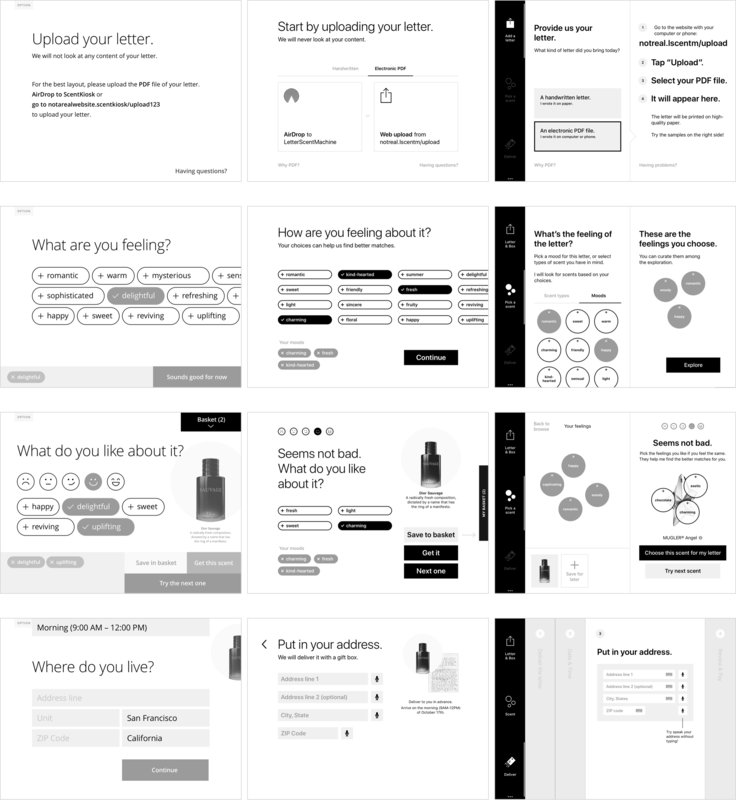 Scent is subjective, so a content-based recommendation system allows people to be subjective too. It constructs a personal and intimate experience that brings joys and surprise to the exploration of scents. 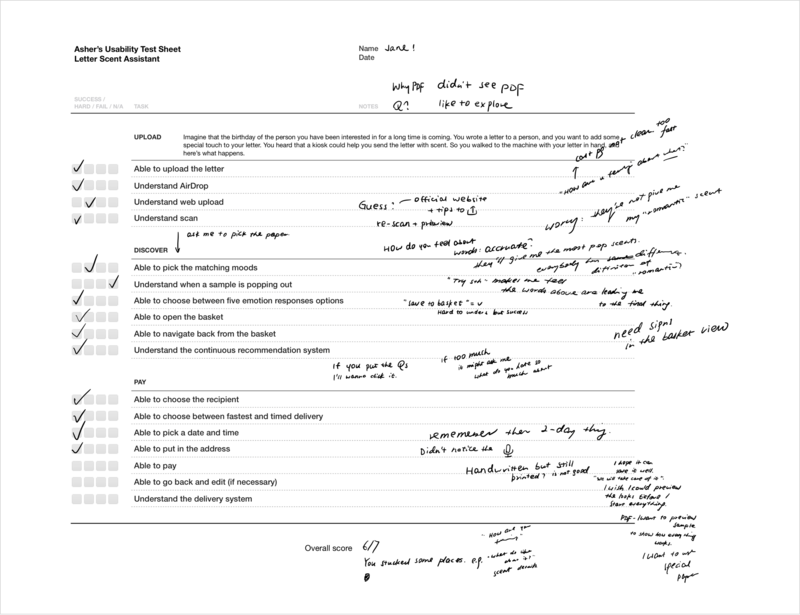 I tested the prototypes with multiple participants of target audience. Throughout the usability iterations, I learned that being able to let people change their mind is extremely important, and people shouldn’t be confused about the complexity of the choices. The new tab structure reveals itself as people go through three steps. They are able to go back to any specific step at any time before the purchase. Building the low-fidelity physical prototype with foam core and cardboard helped me learned how the software and hardware deliver a unified experience. 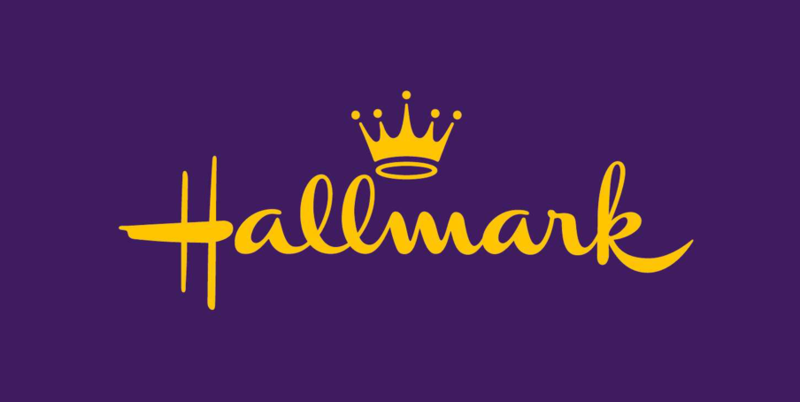 Hallmark is a gifting company that appreciates personalized and unexpectedly delightful gifting experiences. I conducted competitive visual audit and looked for a unique visual identity that aligns with the main brand. The project was a fun exploration. 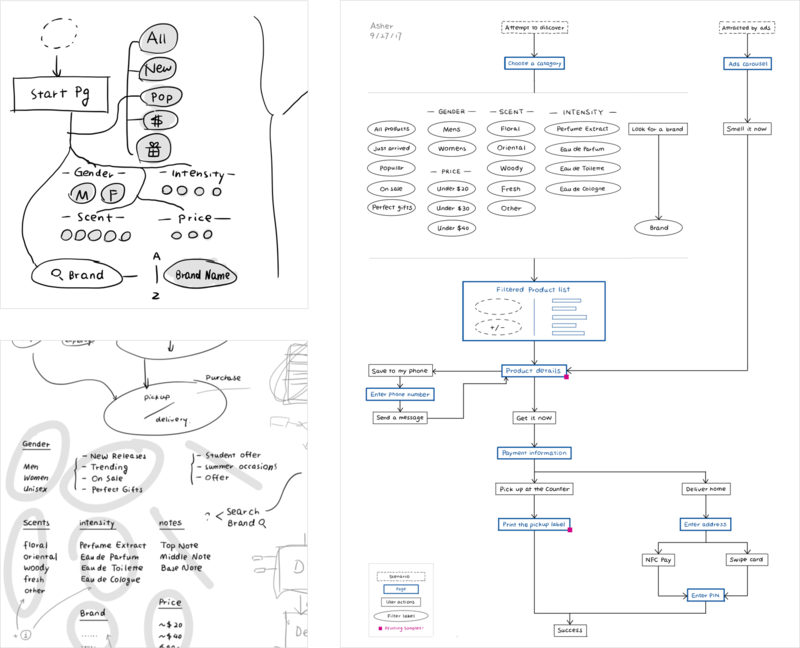 I imagined an entirely new service, learned how to bring it alive, and created a visual identity stemmed from an existing design system. In the process, I learned how to engage with people, especially strangers. I listened to their stories and experiences and received meaningful feedback on my design. If I had more time, I would validate the concept with customers and connect with potential stakeholders.